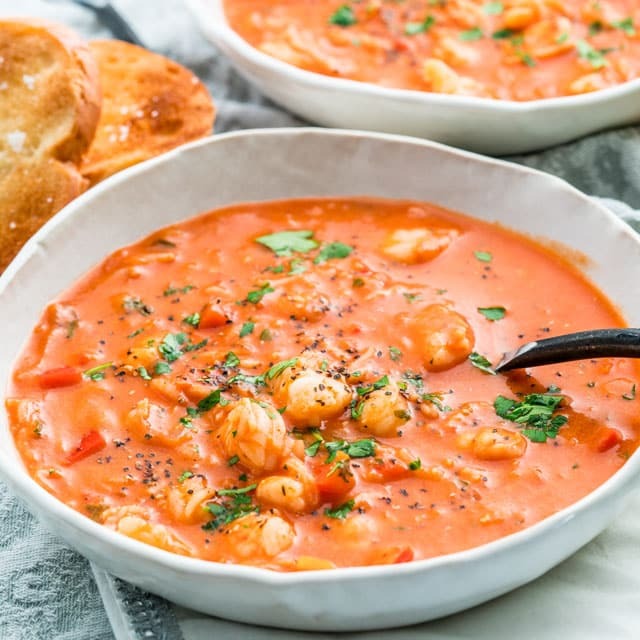 This Brazilian Shrimp Soup is an incredibly delicious tomato creamy soup with shrimp, coconut milk and seasoned to perfection. Perfect for any occasion! I kind of promised myself that I’ll stop complaining to you guys about the cold weather here, but I can’t help myself. It’s been a super cold here in Calgary and it doesn’t seem like it’s going to end anytime soon. It’s almost March already, I’m ready for spring, I want to hear the birds chirping outside, I want to see the trees budding, I want to see the grass, I want to stop wearing thick winter coats and gloves, I want to go outside and feel the sun on my face, and not my nose hairs freeze. Yes I said nose hairs, I have nose hairs, I’m sure you do too. I’m tired of the snow! Breathe! Ok, I think I need a chill pill! Wrong choice of words there. Anywho, on such wonderful cold weather, there’s nothing better than a delicious creamy soup. With shrimp! And coconut milk! And shrimp, large shrimp. Did I mention it’s cold here? 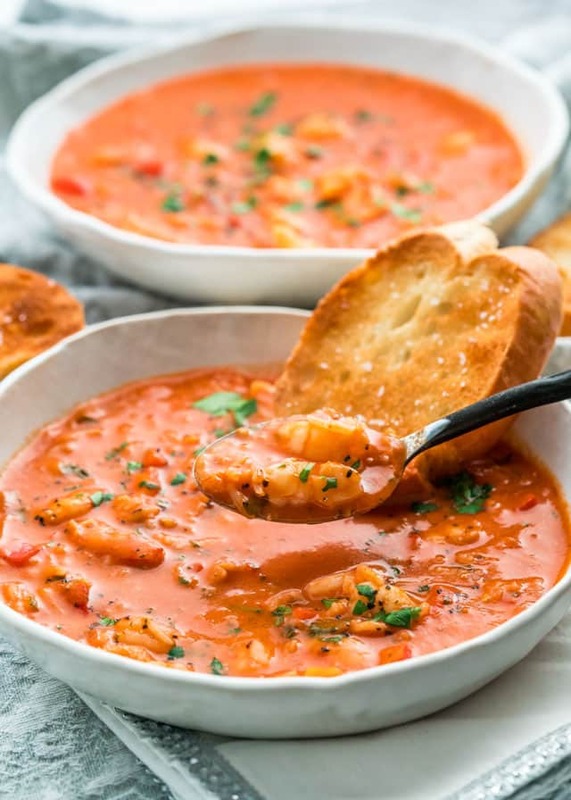 So, as you can see in the picture above my shrimp were quite big, because that’s the kind of gal I am, I like my shrimp big, but don’t let that stop you from making this soup. 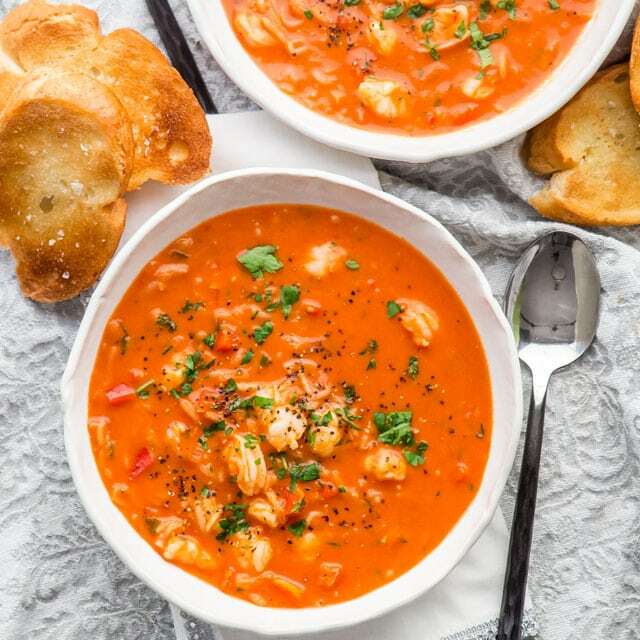 The little tiny shrimp that are precooked would be perfect in this yummy creamy soup. But aren’t they purrty? This soup is so amazing because it’s about as easy as soups can get, but it’s still one delicious and comforting soup. In a large soup pot heat the olive oil over low heat. Add onion, bell pepper, garlic and cook stirring occasionally until the onion and pepper are soft. About 5 minutes. Add the rice, red pepper flakes, salt, tomatoes and water to the pot and bring a boil. Cook until the rice is almost done, about 10 minutes. Stir the coconut milk into the soup. Bring to a simmer and then stir in the shrimp. Simmer, stirring occasionally, until the shrimp is just done, 3 to 5 minutes. Heavy cream could be used as a substitute for the coconut milk. I made this for my kids when they came home from college. I tweeked the recipe by using seafood stock instead of water, and topped with toasted coconut. They loved it. A great recipe. But when your out of things you improvise. I had no peppers, so I subbed mushrooms. I added 1 yellow and 1 green zucchini at the very end, so as not to get soggy. I doubled the rice with brown. I doubled the shrimp with 2 lbs. My wife loved it. And so did I. Sometimes you just need a start that’s good. Thank you for the recipe. 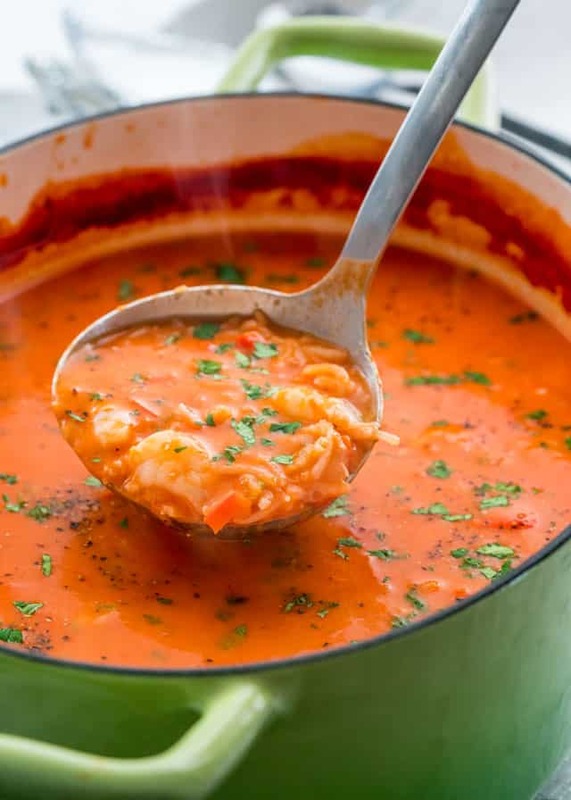 Both my husband and I absolutely loved this soup … and, it was even better the next day! 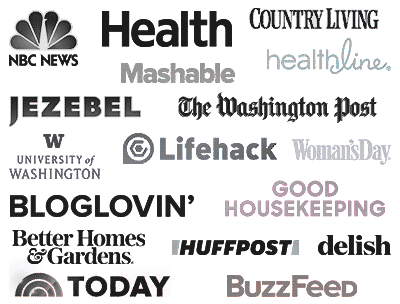 I’ve forwarded the link to literally everyone I know, who enjoys shrimp and good home made recipes! This was delicious and really very easy. I added some chopped kale to make it a little more colorful. Spinach would be good, also. I also added some okra because I had some on hand. I am putting it in my 5 Star recipe file because it is a 5 star. I will make it often. Excellent soup! I just added a tad more rice to make a thicker soup otherwise followed it as written. Am currently making for a luncheon Christmas party that I am catering. I made this for dinner, and my family loved it. Thanks! Can I use Minute Rice? If the answer is yes, I would follow this recipe as written? I made this last night. I made Minute Rice separately and added when it was done absorbing the water. Would have been easier if I could have just added the Minute Rice when and how the recipe called for it. It was very good. I made 1/2 recipe. Husband said a keeper. 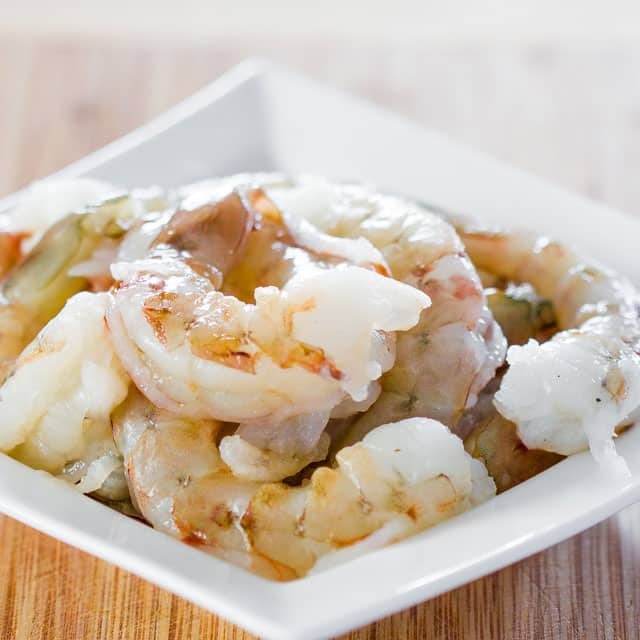 Add the minute rice at the same time as the shrimp, 5 minutes will be enough time to cook it. This recipe was perfect. I heated it up at work and several people said the aroma smelled amazing. The only change I made was sub canned green chilies for green peppers. Next time, I plan to add more rice. I did cook my shrimps separately and later added to the mixture. I made this yesterday and it is delicious!! 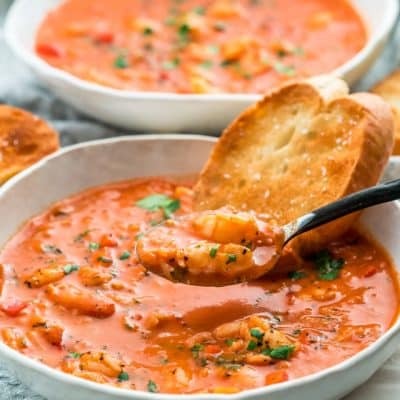 If i had some okra, i would add it–then it would be like shrimp gumbo!! I used more rice than it clled fir and added my own taste buds spices–very east to make-one large pan! This was excellent! I subbed heavy cream, added a little clam juice and added 1/2 pound of crab meat and 1 pound of bay scallops.. I made this recipe for a group of friends last night and today everyone is asking for the recipe. It was delicious!!! I doubled the recipe and used vegetable broth instead of water. I will surely be making this soup again!! It’s my favorite soup! We’re so glad it was such a hit. This is quite frankly…. excellent! 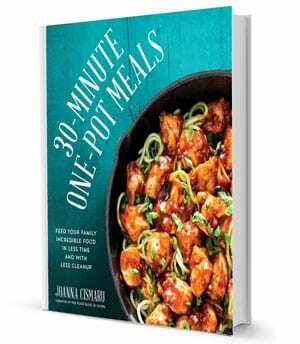 HOWEVER, if your dieting and want a low carb, sugar free recipe, this won’t fit. But hey…. life s too short to deny yourself delicious food all together. If you are going to “fall off the wagon” this is the one to fall off for.